The patient is in the state of opistotonus. Opistotonus, a kind of convulsive position resulting from simultaneous voltage extensor back and neck. When opistotonus head leans back of the spine is curved arc, sometimes joins a dramatic flattening of the lower limbs (Fig.). 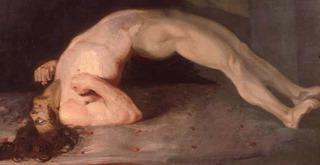 Opistotonus occurs when meningitis, tetanus, tumors of the cerebellum, hypertension and brain injury, rarely in hysteria. Treatment is the removal of the underlying disease. Opistotonus (opisthotonus; from the Greek. opisthen - back and tonos - voltage) - convulsive pose (rigidity), called joint tonic tension extensor back and neck. The head when opistotonus leans back, sometimes joins pronounced extension of the limbs, especially the bottom (Fig.). Experimental studies on animals show that the Acting occurs when the transection brain stem at the level of anterior sections when saving the vestibular nuclei and vestibulospinal ways. The acting is further enhanced when removing the cerebellum. Of great importance are under the influence of cortical field 4s "suppressor" system retikuliarna formations barrel, a defeat which leads to a sharp increase extensor rigidity. Opistotonus appears when tetanus (see), in children with purulent meningitis (see) as a result of irritation of the lower surface of the brain stem, clusters of blood, pus in the basal cisterns (infectious meningitis, trauma). O. amplified by reflex actions extending from the rear of the roots. The acting is also observed by tumors of the posterior cranial fossa, especially in the fourth ventricle. Sometimes Acting appears in the form of attacks due to temporary occlusion of the cerebral aqueduct (aquaeductus cerebri). You may experience epileptic seizures by type O., less often hysterical O.